Thousands of Ethiopian-Israelis and sympathizers marched in a demonstration that took a violent turn on Sunday. 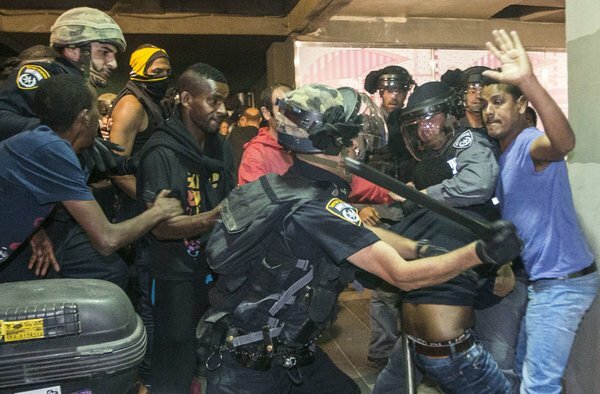 The trigger for the rage now spilling onto Israel’s streets came just over a week ago, when a police officer was caught on a security camera beating an Ethiopian-Israeli soldier in uniform in the city of Holon, in the Tel Aviv suburbs, for no apparent reason. “Enough of racism, enough of violence!” the crowd in Tel Aviv chanted, the words rhyming in Hebrew. “A violent police officer should be in prison,” they shouted. Some raised Israeli flags or crossed their fists in the air. A smaller demonstration in Jerusalem on Thursday also ended with the protesters hurling stones and bottles at the police. In an effort to curb the unrest, Mr. Netanyahu said he would meet on Monday with representatives of the Ethiopian group, including the soldier who was beaten, Damas Pakado. Mr. Netanyahu said the meeting would also be attended by the nation’s police chief and representatives of several ministries, including Immigrant Absorption. The police chief, Yohanan Danino, has already announced that the officer filmed beating Mr. Pakado had been fired. He also established a team of police representatives and Ethiopian community leaders that will try to improve relations. Among those demonstrating on Sunday was Uri Muallem, 30. Describing an encounter with the police in 2010, he said he had been drinking when he stepped out of a family gathering at a wedding hall to relieve himself on the sidewalk. A slight man, barely five feet tall, Mr. Muallem, from the Tel Aviv suburb of Rishon Lezion, said three police officers fired pepper spray into his eyes and handcuffed him. He then spent three days in jail and was sentenced to four months of community work “for attacking a police officer,” he said. Another demonstrator, Eli Malassa, 33, from the desert town of Netivot in southern Israel, recalled that when he was performing his compulsory military service about 15 years ago, a police officer accused him of stealing the uniform he was wearing and beat him. Both men came to Israel from Ethiopia with their families in 1991 on a secret airlift known as Operation Solomon, which brought 14,000 Ethiopian Jews to Israel in a span of 36 hours and was cause for an outpouring of national celebration at the time. Relations with the younger generation of Ethiopians who were born or grew up in Israel have since frayed. Guy Ben-Porat, an associate professor in the department of public policy and administration at Ben-Gurion University of the Negev, has been researching relations between the police and different sectors of Israeli society for three years. He said that Ethiopian-Israelis perceived themselves, much like blacks in the United States, as subject to “overpolicing,” including racial profiling; being stopped and arrested more often than other, “white,” Israelis; and being treated with a tougher hand. “Ethiopian-Israeli citizens strongly believe that they are discriminated against and harassed,” Mr. Ben-Porat said. “Young Ethiopian males in particular feel the police are out to get them and that they won’t get justice,” he added. Micky Rosenfeld, a spokesman for the Israeli police, rejected the accusations of police racism and comparisons to Baltimore or Ferguson. In 2012, Ethiopian activists set up a protest tent outside the prime minister’s residence in Jerusalem to draw attention to what they described as unofficial racism and discrimination in Israeli society. Despite significant government resources allocated to aid their integration, young Ethiopian-Israelis said they were still struggling to be accepted.